How to download and install Super Monday Night Combat? Once you supermnc_setup.exe downloaded, run the setup and launch it. Follow the on-screen instructions to complete the setup. You can now launch Monday Night Combat from the desktop shortcut. Super Monday Night Combat (SMNC) is a third-person shooter Multiplayer Online Battle Arena action video game developed and published by Uber Entertainment for Microsoft Windows, and was released on this platform as a free-to-play (FTP) game on April 18, 2012, and was available for download via Steam. Using the Unreal Engine, Super Monday Night Combat incorporates real-time strategy elements with a sports-based simulation experience and is the sequel to the previous game Monday Night Combat. Super Monday Night Combat’s gameplay design is heavily influenced by the popular custom-made mod map Defense of the Ancients (DotA) of The Frozen Throne expansion of the old classic MOBA game Warcraft III: Reign of Choas. But despite being influenced in gameplay, Super Monday Night Combat puts the player in a third-person perspective unlike the ‘from-the-sky’ view used by DotA and many other MOBAs of this generation, while also adding unique design elements of its own to create a whack and creative combat experience more varied and deeper than its predecessor. In Super Monday Night Combat, players take on the role of a “Pro” from the wide selection of 10 available, which are classified into “Classes” based on their stats and playing styles, each with three unique skills that players have to master. After selecting their Pros, players form two opposing teams called the Hotshots and the Iceman, and they must attempt at destroying the other team’s Moneyball—a stationary orb that collects money of its team. The team uses various strategy and teamwork to try to accomplish this task while being helped by swarms of friendly AI robots on both sides, and the first team that succeeds wins the match. The team that turns out the victor is awarded experience points, which denote a character’s ranking in the global leaderboard and provides them with the ability to upgrade their Pros weapons and abilities, along with various customization perks. 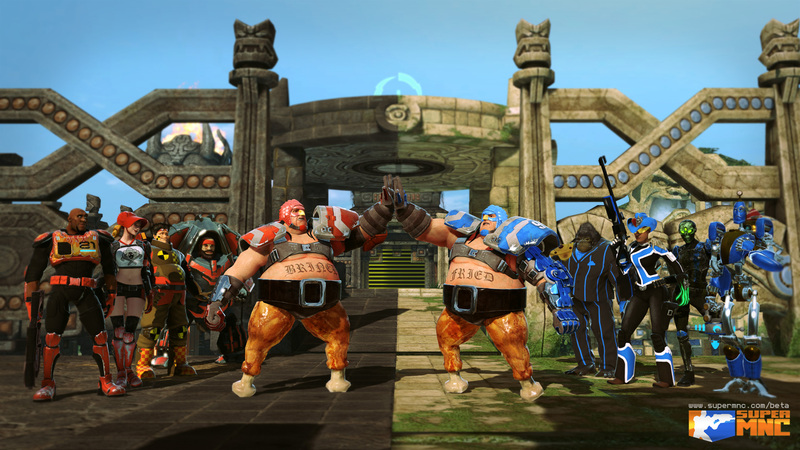 Super Monday Night Combat provides players with two additional modes of gameplay aside from the main online version. The first mode is called the Super Blitz mode and is a survival mode in which up to 5 players have to defend their Moneyball while being continually swarmed by enemy AI robots and taunted by the game’s own announcer, called GG Stack. This mode is an endless horde mode, however, there is a break every 10 rounds after a particularly strong wave of robots called Jackbots invade, during which players can build or heal protective towers around the Moneyball. During this break players can also play various types of mini-games to warm up for the next round of the match. The next mode is called the Turbocross mode and is designed as a homage to the previous game in the series since it plays very similar to that. This mode was introduced because gameplay elements of Super MNC were vastly different from those of MNC. Super Monday Night Combat stopped receiving updates and patches by 2013, but it is still available on Steam and is still played by players casually around the world.